Vibrant Communities • Combine multiple funding sources to support local or regional comprehensive community-based projects. 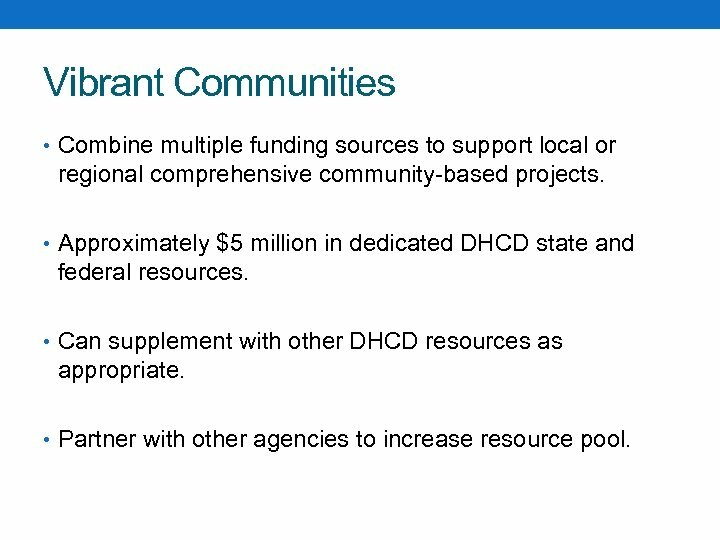 • Approximately $5 million in dedicated DHCD state and federal resources. • Can supplement with other DHCD resources as appropriate. • Partner with other agencies to increase resource pool. 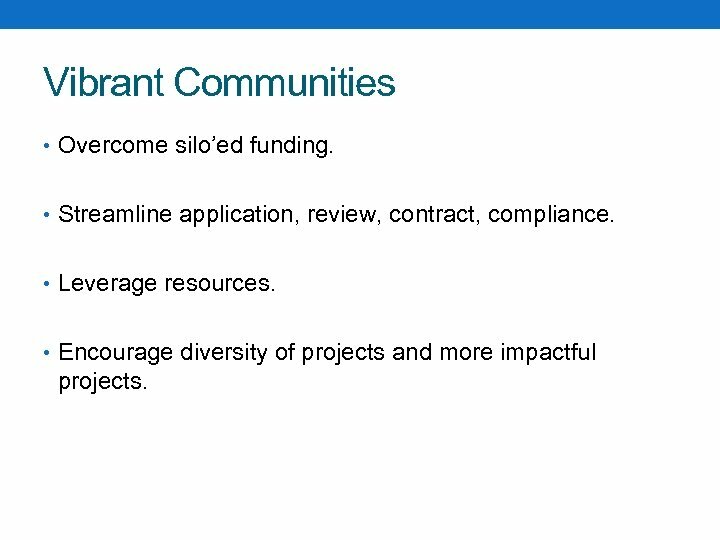 Vibrant Communities • Overcome silo’ed funding. • Streamline application, review, contract, compliance. • Leverage resources. • Encourage diversity of projects and more impactful projects. 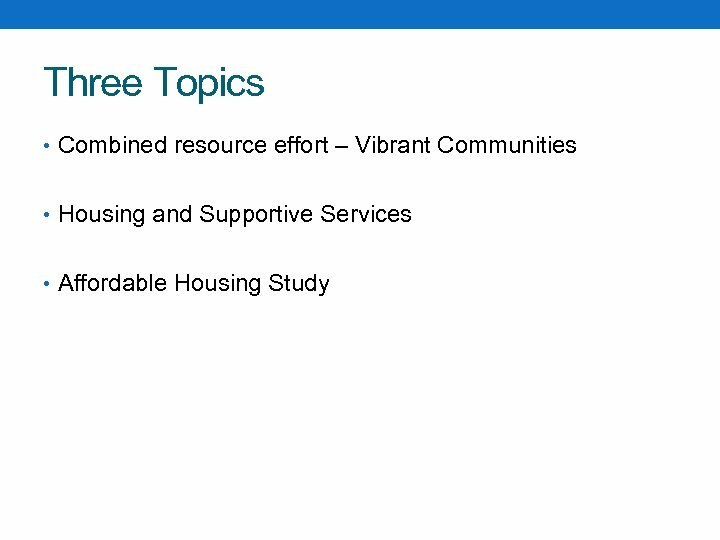 Vibrant Communities • 2 -3 projects initially. • Up to $2. 5 million per project. 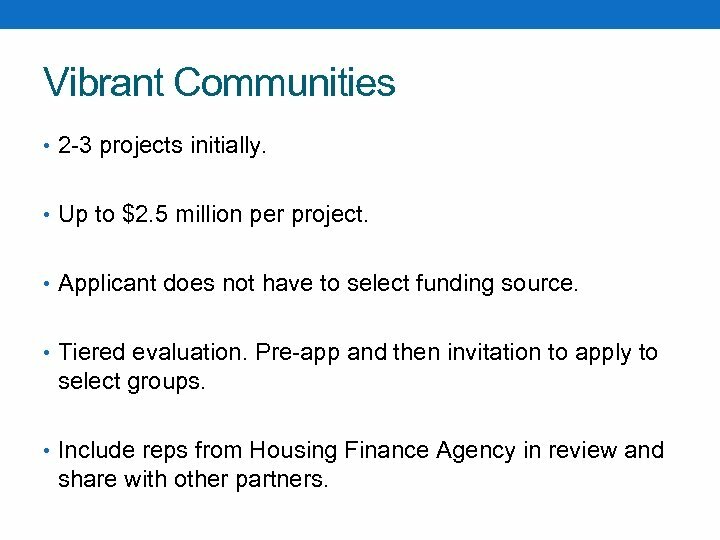 • Applicant does not have to select funding source. • Tiered evaluation. Pre-app and then invitation to apply to select groups. • Include reps from Housing Finance Agency in review and share with other partners. 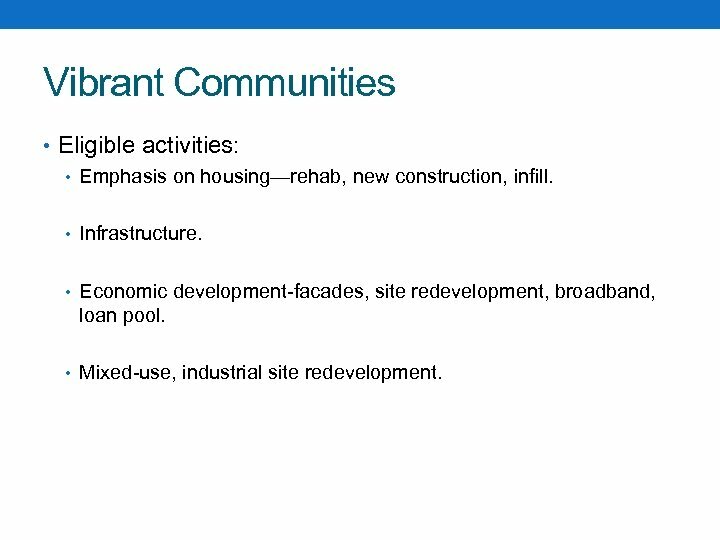 Vibrant Communities • Eligible activities: • Emphasis on housing—rehab, new construction, infill. • Infrastructure. 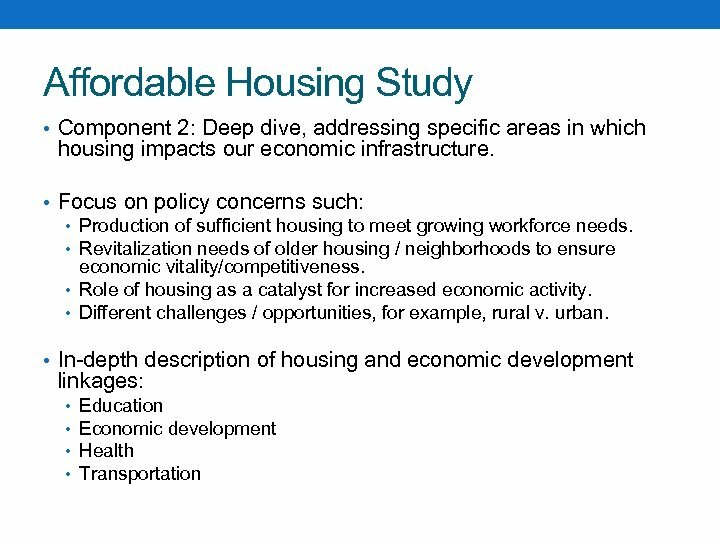 • Economic development-facades, site redevelopment, broadband, loan pool. • Mixed-use, industrial site redevelopment. 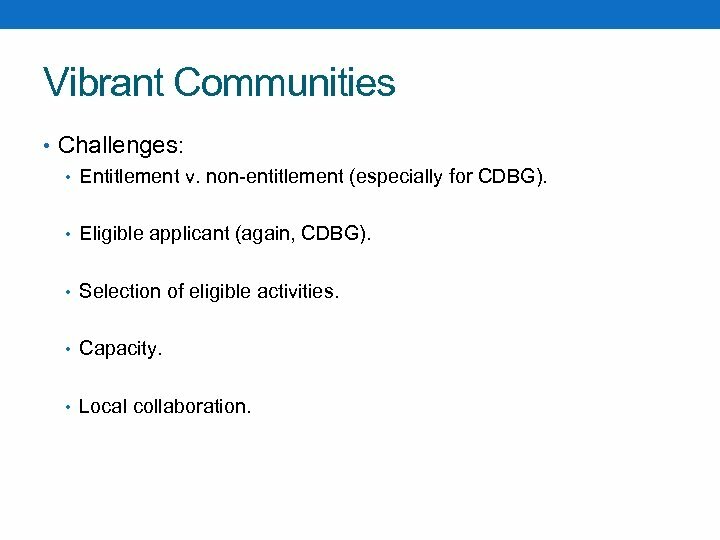 Vibrant Communities • Challenges: • Entitlement v. non-entitlement (especially for CDBG). • Eligible applicant (again, CDBG). • Selection of eligible activities. • Capacity. • Local collaboration. 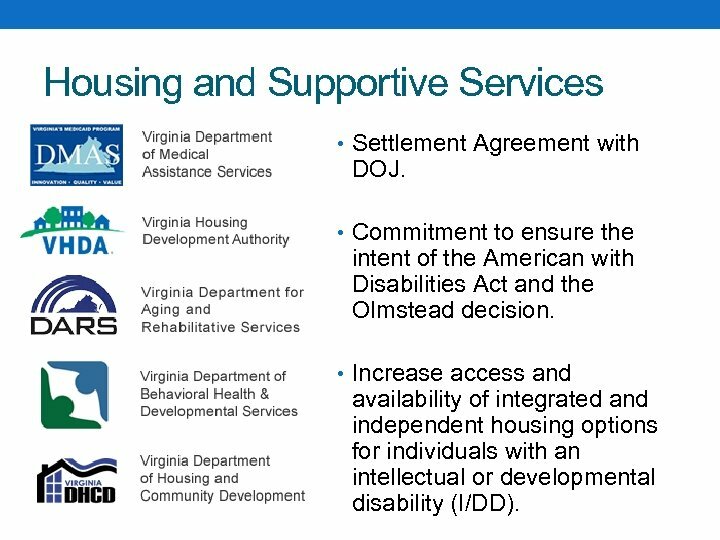 Housing and Supportive Services • Settlement Agreement with DOJ. • Commitment to ensure the intent of the American with Disabilities Act and the Olmstead decision. 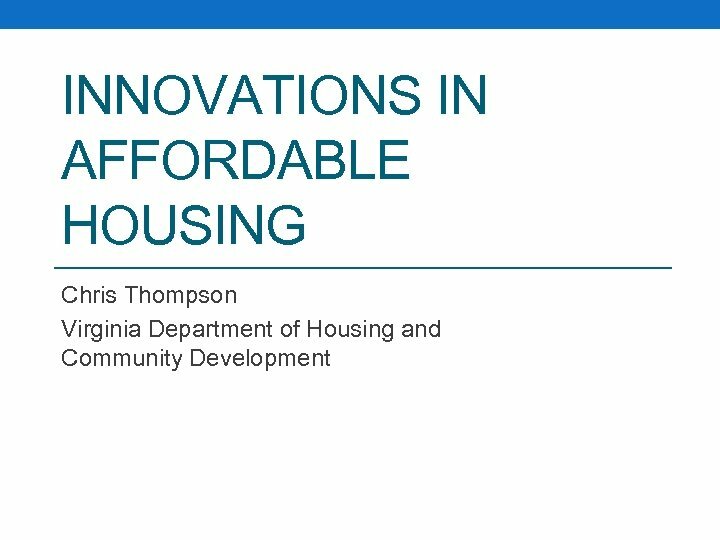 • Increase access and availability of integrated and independent housing options for individuals with an intellectual or developmental disability (I/DD). 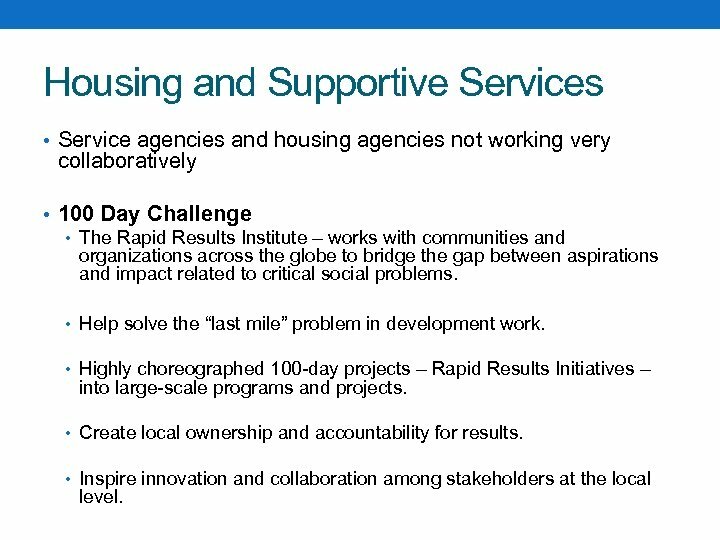 Housing and Supportive Services • Service agencies and housing agencies not working very collaboratively • 100 Day Challenge • The Rapid Results Institute – works with communities and organizations across the globe to bridge the gap between aspirations and impact related to critical social problems. • Help solve the “last mile” problem in development work. • Highly choreographed 100 -day projects – Rapid Results Initiatives – into large-scale programs and projects. • Create local ownership and accountability for results. • Inspire innovation and collaboration among stakeholders at the local level. 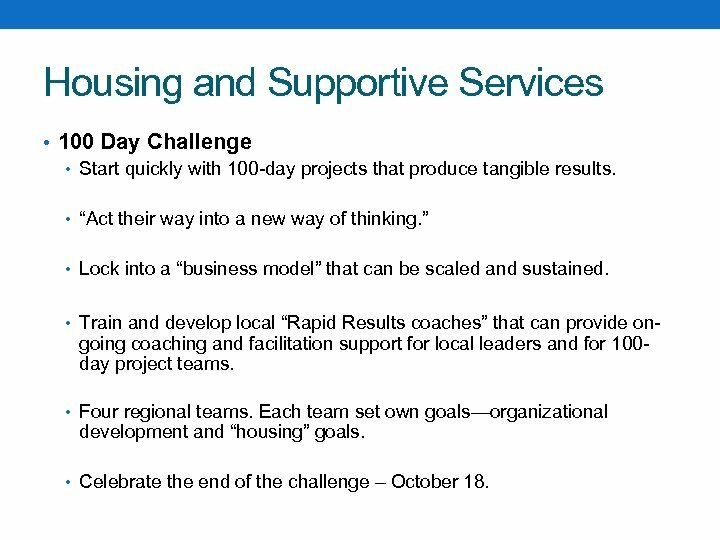 Housing and Supportive Services • 100 Day Challenge • Start quickly with 100 -day projects that produce tangible results. • “Act their way into a new way of thinking. ” • Lock into a “business model” that can be scaled and sustained. • Train and develop local “Rapid Results coaches” that can provide on- going coaching and facilitation support for local leaders and for 100 day project teams. • Four regional teams. Each team set own goals—organizational development and “housing” goals. • Celebrate the end of the challenge – October 18. 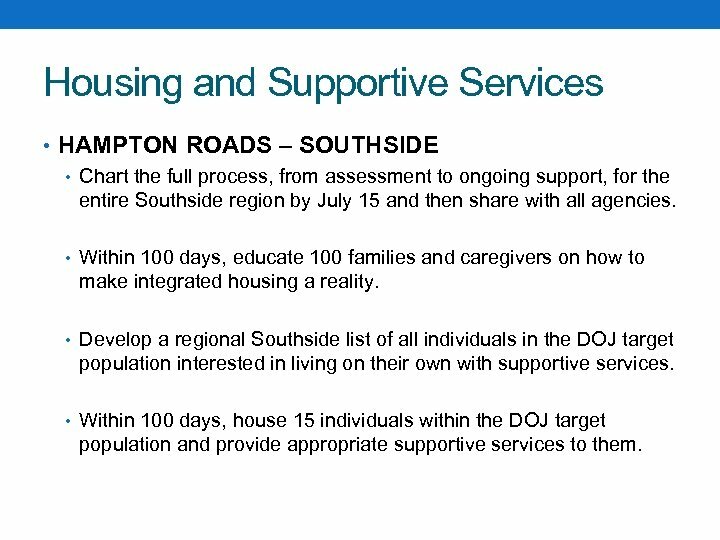 Housing and Supportive Services • HAMPTON ROADS – SOUTHSIDE • Chart the full process, from assessment to ongoing support, for the entire Southside region by July 15 and then share with all agencies. • Within 100 days, educate 100 families and caregivers on how to make integrated housing a reality. • Develop a regional Southside list of all individuals in the DOJ target population interested in living on their own with supportive services. • Within 100 days, house 15 individuals within the DOJ target population and provide appropriate supportive services to them. 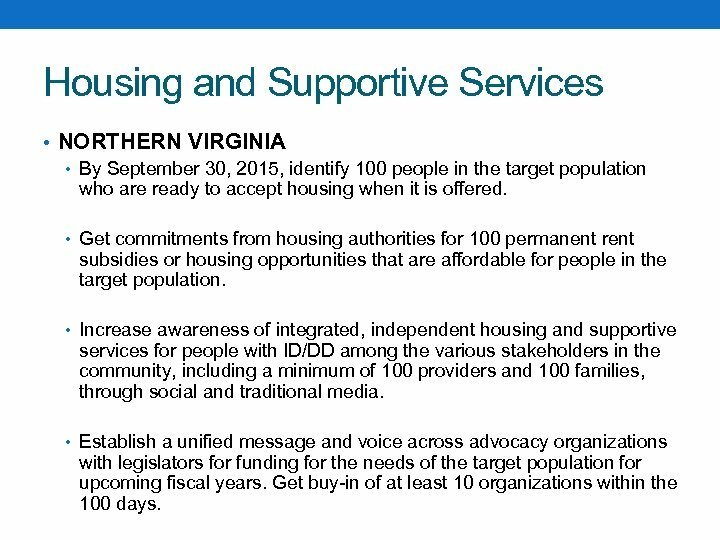 Housing and Supportive Services • NORTHERN VIRGINIA • By September 30, 2015, identify 100 people in the target population who are ready to accept housing when it is offered. • Get commitments from housing authorities for 100 permanent rent subsidies or housing opportunities that are affordable for people in the target population. • Increase awareness of integrated, independent housing and supportive services for people with ID/DD among the various stakeholders in the community, including a minimum of 100 providers and 100 families, through social and traditional media. • Establish a unified message and voice across advocacy organizations with legislators for funding for the needs of the target population for upcoming fiscal years. Get buy-in of at least 10 organizations within the 100 days. 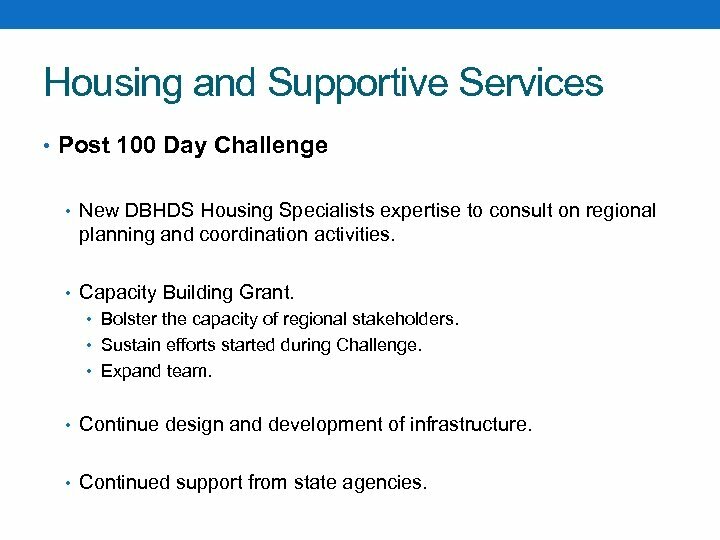 Housing and Supportive Services • Post 100 Day Challenge • New DBHDS Housing Specialists expertise to consult on regional planning and coordination activities. • Capacity Building Grant. • Bolster the capacity of regional stakeholders. • Sustain efforts started during Challenge. • Expand team. • Continue design and development of infrastructure. • Continued support from state agencies. 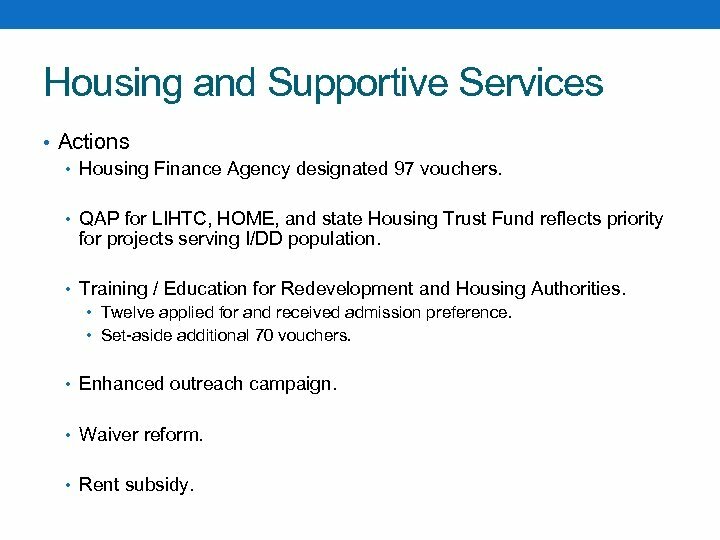 Housing and Supportive Services • Actions • Housing Finance Agency designated 97 vouchers. 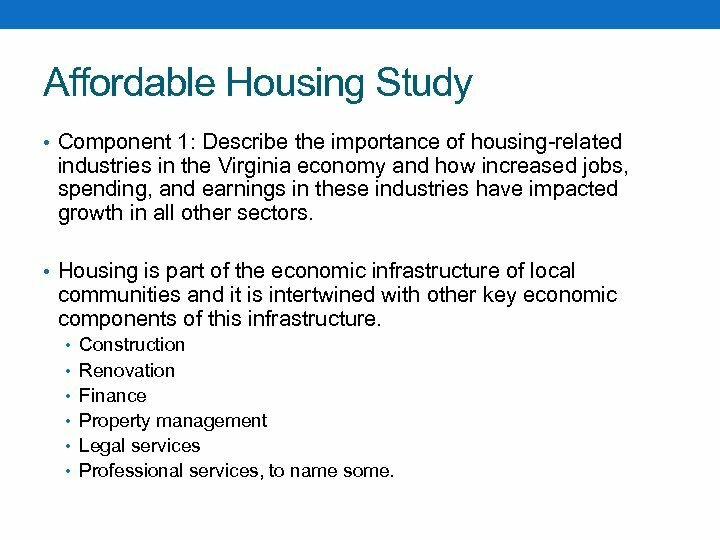 • QAP for LIHTC, HOME, and state Housing Trust Fund reflects priority for projects serving I/DD population. • Training / Education for Redevelopment and Housing Authorities. • Twelve applied for and received admission preference. • Set-aside additional 70 vouchers. • Enhanced outreach campaign. • Waiver reform. • Rent subsidy. 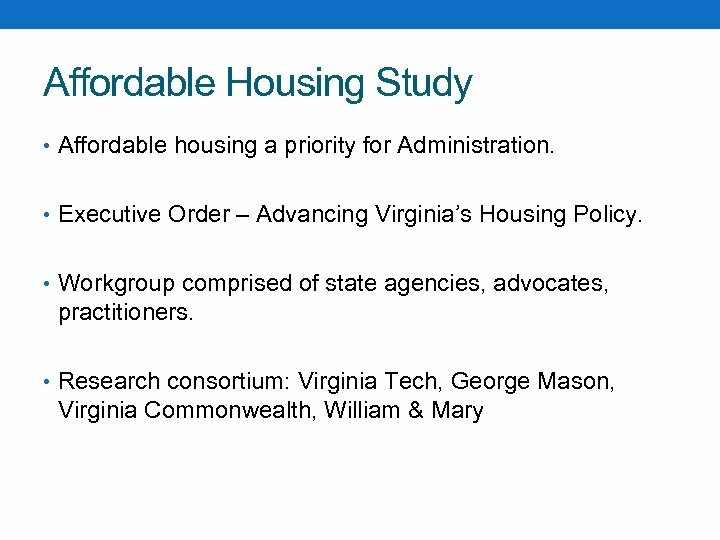 Affordable Housing Study • Component 1: Describe the importance of housing-related industries in the Virginia economy and how increased jobs, spending, and earnings in these industries have impacted growth in all other sectors. • Housing is part of the economic infrastructure of local communities and it is intertwined with other key economic components of this infrastructure. • Construction • Renovation • Finance • Property management • Legal services • Professional services, to name some. 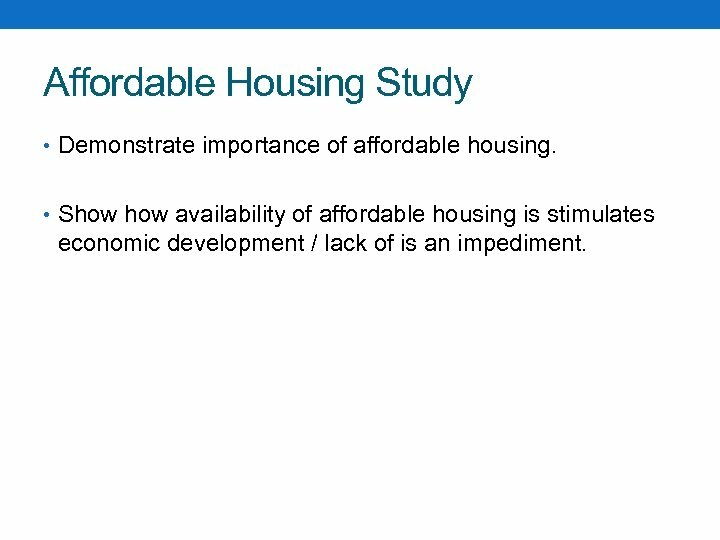 Affordable Housing Study • Demonstrate importance of affordable housing. 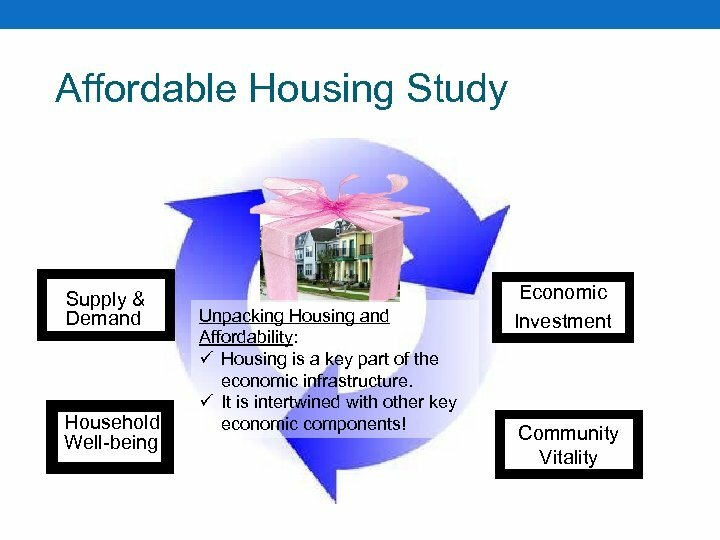 • Show availability of affordable housing is stimulates economic development / lack of is an impediment.